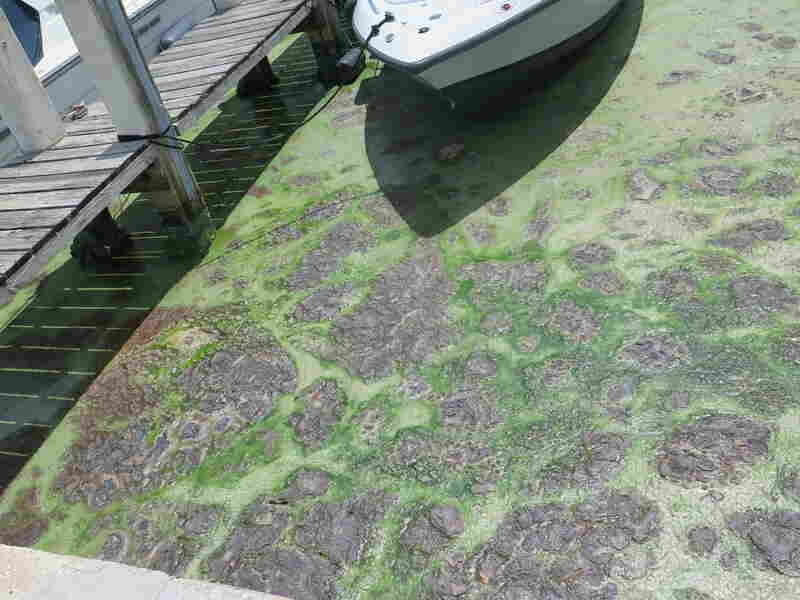 'A Government-Sponsored Disaster': Florida Asks For Federal Help With Toxic Blue-Green Algae Bloom The massive toxic algae bloom in Florida is threatening businesses and the health of people and animals. The state is asking for federal help for a disaster that's both natural and political. 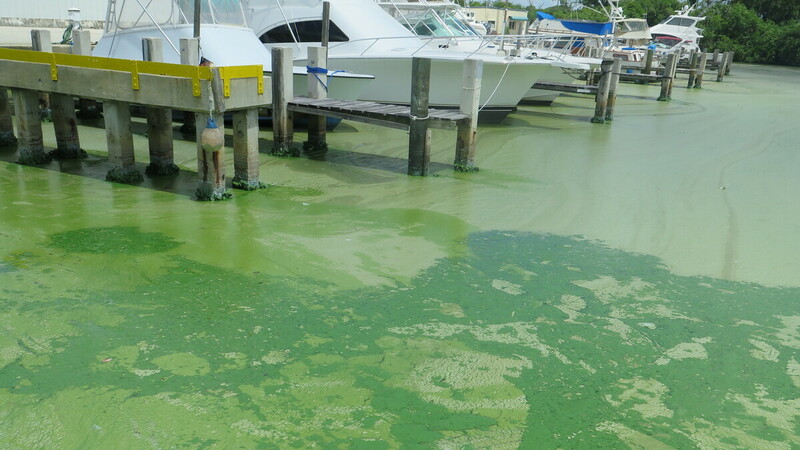 The cause of the foul smell is a massive algae bloom that has affected beaches and fishing in communities along the St. Lucie River. The blue-green algae is especially worrisome because it can be toxic and harmful to people and animals that come into contact with it. In Stuart, Skinner says a thick layer of the blue-green algae began accumulating on the water in the marina last month. It's now a couple of inches thick in some areas — a greenish muck that coats the docks and the boats. He says the muck is hurting his sales. "I have people that have bought boats and don't want to put it in the water," Skinner says. "And people who don't want to buy a boat because it's disgusting in there. They don't want to put it in. It stains the boats, it smells horrible and it's toxic." "It stains the boats, it smells horrible and it's toxic," says the boat salesman John Skinner. It's called blue-green algae, but it's actually a type of bacteria called cyanobacteria. It typically thrives in freshwater. Under certain conditions, the bacteria can release a wide variety of toxins that affect the liver and nervous system. And blue-green algae occurs naturally. But Mike Conner of the environmental advocacy group Bullsugar.org says there's little natural about this case. "This is a man-made — this is a government-sponsored disaster," he says. In Ed Fielding's view, this is a natural disaster, but one that also involves politics. "We watched the algae come down the locks into the St. Lucie," he says. Fielding is a member of the Martin County Commission, which includes Stuart and surrounding communities. 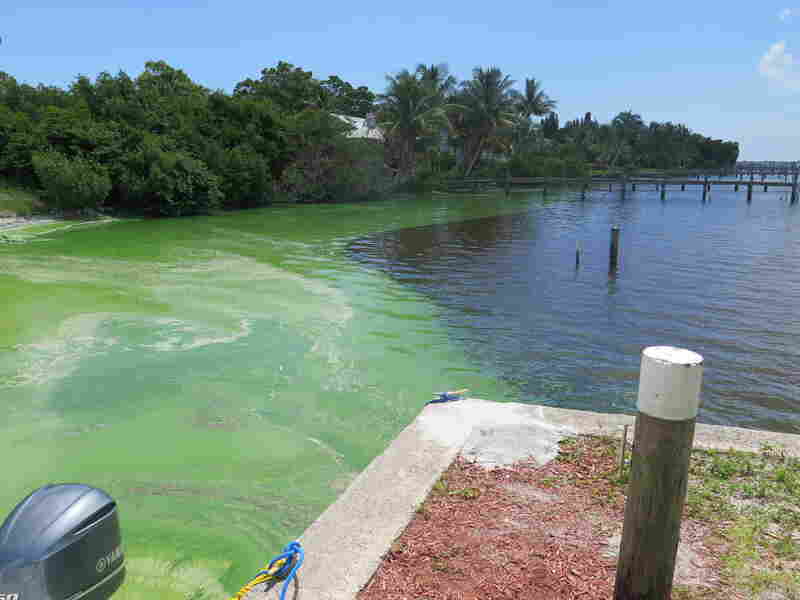 The bloom of blue-green algae first showed up months ago in Lake Okeechobee, which occupies part of the county. It's the second-largest natural freshwater lake in the lower 48 states and a catch basin for central and South Florida. Fearful that the algae bloom could spread, Fielding says the commission asked the Army Corps of Engineers, the federal agency that controls the lake, not to release lake water east into the St. Lucie River. Citing public safety, the Corps decided to release the water anyway. "We are one of the exit valves, the safety valves for when the lake builds up to high levels," Fielding explains. "It was an enormously unusual wet year. The lake can build up six times faster that we're able to release." Florida Gov. Rick Scott has asked President Obama to declare a federal emergency and make federal emergency funds available to deal with the algae bloom. The Corps is keeping the water level low in Lake Okeechobee to prevent a possible breach of the 80-year-old earthen dike that surrounds the lake — a breach that could be catastrophic and lead to flooding in nearby communities. Because of the massive algae bloom, Florida Gov. Rick Scott has asked President Obama to declare a federal emergency and make federal emergency funds available. The White House rejected the request, saying Florida has the resources to handle the problem itself. Scott is appealing the decision. Mark Perry is the executive director of the Florida Oceanographic Society, an environmental education and research center in Stuart. He agrees that the Obama administration and federal agencies like the U.S. Fish and Wildlife Service, the National Oceanic and Atmospheric Administration, and even the Centers for Disease Control and Prevention should be involved in managing the algae crisis. But the long-term solution, he says, is to restore the region's natural flow — and send water from Lake Okeechobee south through lands farmed by some of the nation's largest sugar producers. Florida signed a deal to buy some of those sugar lands eight years ago. Gov. Scott has turned his back of the deal, Perry says, essentially ignoring the problem. In 2014, voters approved an amendment that set aside money to acquire the land. "The state is not taking the leadership and saying the citizens have spoke," Perry says. He thinks Gov. Scott needs to do more. "We need to uphold their interests and do the right thing — and that is, buy the land and send the water south." While officials, environmentalists, and business interests point fingers over who's to blame, they all agree that with warm weather and continued releases of water from Lake Okeechobee, the bloom of toxic algae in the St. Lucie Estuary is likely to persist for the foreseeable future. In the audio of this story, as in an earlier Web version, Lake Okeechobee is called the second-largest freshwater lake in the U.S. In fact, it is the third-largest natural freshwater lake entirely within the borders of the U.S. Lake Michigan and Alaska's Iliamna Lake have larger surface areas.